Welcome to the Index Historical Society gallery, showing samples of photos on view at our museum. Many of our images came directly from Dorothy Pickett, wife of the photographer Lee Pickett whose negatives she gave to the University of Washington Allen Library Special Collections. Much of that collection is online through the library. A great number of our photos have come from residents’ family albums. Exhibits change each year, and in addition we offer viewing of our full collection on the museum’s public-access computer. 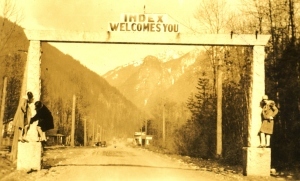 Ruby Egbert is one of the women posing at the Index entry arch on the old Cascade Highway that entered town on the west end. Photo from the Egbert album via Bob Morse. Clarence and Ella Bush tend the roses around their Bush House Hotel ca.1910. Photo from the Steve Hall family collection. Lee Pickett’s photo #1804 of the Bush House Hotel was taken between 1926 and 1929. Copies are available through the University of Washington, Special Collections. I have a turn of the century photo I think is of the Granite Quarry. My greatgrandfather worked there sometime from 1895 to 1910. I would love to try to send you a jpg and see if you have ever seen the photo. It is large and studio taken by a Darius Kinnsey from Seattle. Looks like a company employee picture. I am a model railroader. My partner and I have modeled about 1/2 of the Great northern line between Gold Bar and Scenic. Index used to be a major stop and had 2 saw mills. The depot was some different. We have some pictures but are still looking for more to use as we model Your town. We plan on an area of 4 feet by 8 feet in our modules. Thanks for any help. I might be in Your area next month.